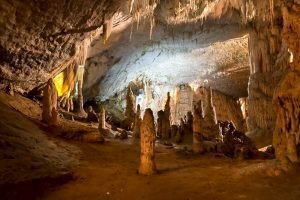 The timelessness of Postojna Cave can already be felt on the promenade in front of the cave where groups belonging to different generations gather to visit this place. Postojna Cave is a network of 20 kilometres of passages, galleries and chambers into which experienced guides have accompanied more than 35 million visitors in the last 188 years. It is the largest cave in the “classic karst” and the most visited show cave in Europe. In 1872 railway lines were laid in the cave; electricity arrived in 1884. Today you begin your visit aboard the cave train; the electric lighting allows you to admire the size and splendour of the underground world, where the geological past is recorded in a unique manner. Visitors to the cave are dazzled by a wealth of speleothems: calcite formations, stalactites and stalagmites abounding in a variety of shapes, colours and age. The constant temperature in the caves ranges from 8 to 10° C.